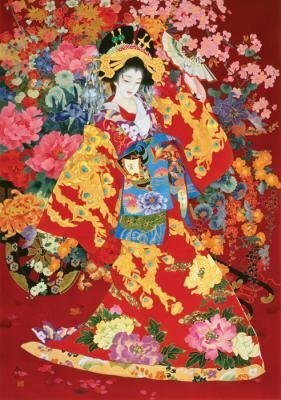 This is a 250 piece, stunning puzzle of a Japanese geisha. 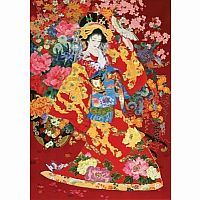 It is made by British wooden puzzle manufacturer Wentworth. All pieces are laser cut and the puzzle contains whimsies, pieces that reflect the theme of the puzzle. From the manufacturer: This Wentworth wooden puzzle is a premium quality traditional gift. It is cut in the classic Victorian style, in which every piece is a different shape and selected pieces are cut in shapes that may reflect the image. These 'whimsies' were so called because Victorian puzzle cutters included the shapes 'on a whim', and The Wentworth Wooden Jigsaw Company has revived this old tradition. Manufactured from high quality wood using state-of-the-art, computer driven laser technology, pieces frequently bisected and straight pieces appear in the middle of the puzzle!